Time was ticking on by the time I made my first cast, in fact it was almost dark. 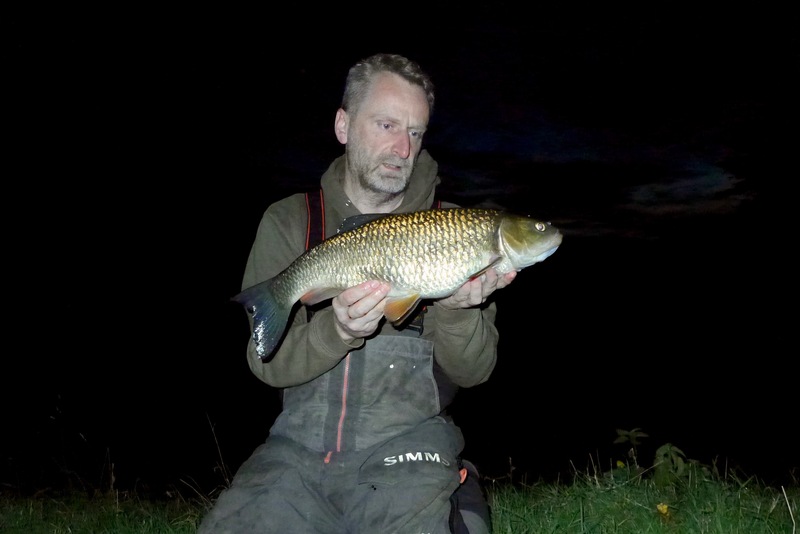 Expectations were high and a Chub splashed just downstream of the left hand rod which is a sure fire indication that a bite would come in the next half an hour as the fish homed in on the bait. Sure enough that’s exactly what happened although to be fair it fought more like a Barbel than a Chub. It’s the first time that I can remember that i’ve had a Chub taking line off the clutch, well apart from when fishing lighter gear and actually targetting Chub. This thing just wouldn’t give in. At first I thought it was a small Barbel and then I wondered if it was a Carp. Sounds hard to believe I know, and trust me I was just as surprised as anyone when a Chub popped up. I weighed it because I thought it looked a solid five but it weighed 4.14. Proper minter though and I suspect the reason why it fought so hard is because it had never been caught. It certainly didn’t look like it had looking inside it’s mouth. 4.14 – Wish they all fought like this one. I didn’t have to wait long until the next bite. Again the left hand rod in the slack water only this one turned out to be heavier and more ponderous. 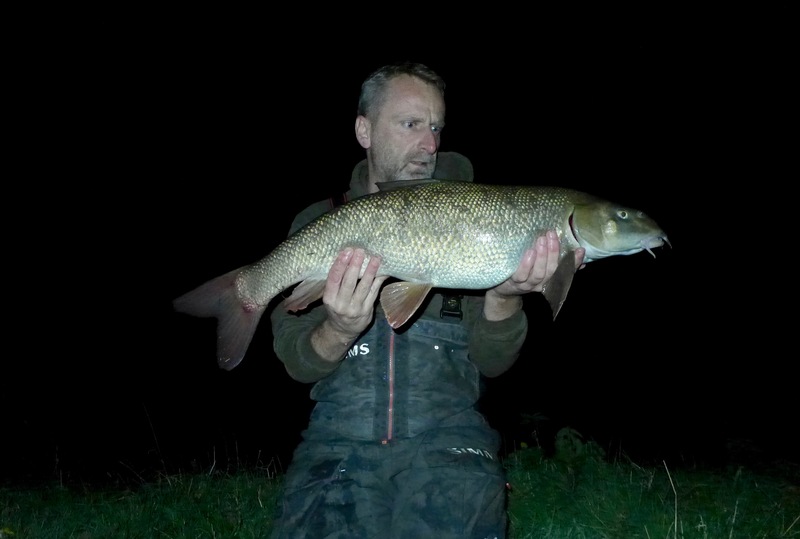 There was definitely no mistaking what this one was though and in the light of the head torch I could make out a decent sized Barbel in the water. It came to the net without too many issues and only when I was resting it did it finally wake up. As you can tell from the title of the post it was another eleven coming in at 11.2. Again, probably never been caught which gave me a proper buzz despite being another eleven. Checking the time it was only 8:30. I’d not even got to the decent time yet so there was a good chance of getting another fish if there was any about. That though is the crux of it, I honestly think there are only the odd fish in these spots and therefore getting two is like a red letter day. Suffice to say I never got another bite despite the river coming alive around 10pm. The problem was everything I heard sounded small and either upstream or downstream of me. I wrapped up just after midnight and make the long trek back to the car across the fields. I was knackered by the time I got back i’ll be honest and even more knackered by the time I got home. I’m debating doing it all again tonight. The only trouble is it’s given a cold northerly out for later with the temperatures plummeting and bringing cold rain with it. Never good conditions. I’m seriously debating staying in and not fishing. I won’t though of course, i’ll be huddled under my new Drennan umbrella giving it an airing. Previous Article Keep your eyes on the prize. Next Article Yep, you’ve guessed it. Thanks very much. Yes i’ve got to admit i’m never disappointed when a Chub picks up the bait. They seem to be making a bit of a comeback around here. Lets hope their recovery continues.